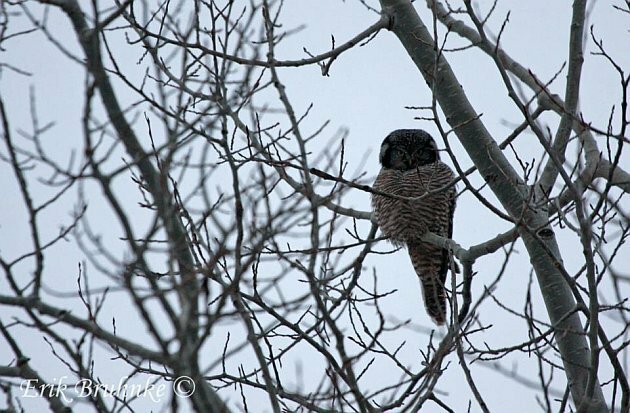 Great Gray Owl, Northern Hawk Owl, Snowy Owl — this trinity captures the imagination of most birders with their imposing presence, unique adaptations, and beauty as among the most desired species of bird to see in the world. As for myself, in January of 2013, I finally took a much anticipated trip up to their world of ice and snow in northeastern Minnesota in search of them. A fellow birder who knew the area joined me, and I am very grateful for his assistance in making this trip a success. My first day in Minnesota included a visit to Sax-Zim Bog, the most famous (and rightly so) birding hotspot in the region. First light revealed my first Common Ravens, a veritable goliath among passerines and the most commonly encountered species in northeastern Minnesota. Scanning the tree tops along Kolu Road, a distant silhouette perched at the very top of a tree stood guard. “That’s a Northern Hawk Owl,” I muttered softly in disbelief and shock. Sure enough, the owl flew in closer and posed proudly on a snag right beside the road. Day one had even more winter teasures in store, however. After ogling at the Northern Hawk Owl, we began to take a tour of the various feeders scattered around Sax-Zim Bog. Due to the harsh climate and low supply of food in the forest, passerines can be rather sparse in winter. 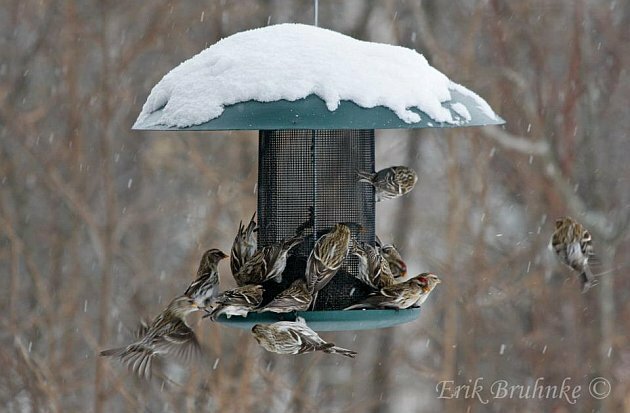 Fortunately for the birder, large numbers of chickadees, finches, and nuthatches swarm around the food generously supplied by people. The Blue Spruce Road feeders were decked with brilliantly colorful Evening and Pine Grosbeaks as gaudy as most any tanager species found in the Neotropics. They were joined by hoards of Common Redpoll and Black-capped Chickadee, along with Red-breasted Nuthatch, Downy Woodpecker, and Hairy Woodpecker. The feeders at Admiral Road had a visiting Boreal Chickadee, and those at Owl Avenue had a Hoary Redpoll. Driving around for other species such as Northern Shrike, Ruffed Grouse, and Rough-legged Hawk afforded plenty of opportunity to soak in the unique beauty of a boreal forest in winter, with many bits of landscape seemingly taken out of a Christmas card scene familiar to me while shopping for them in southern Florida. On the third day, we finally connected with the species I wanted to see the most and just could not miss. 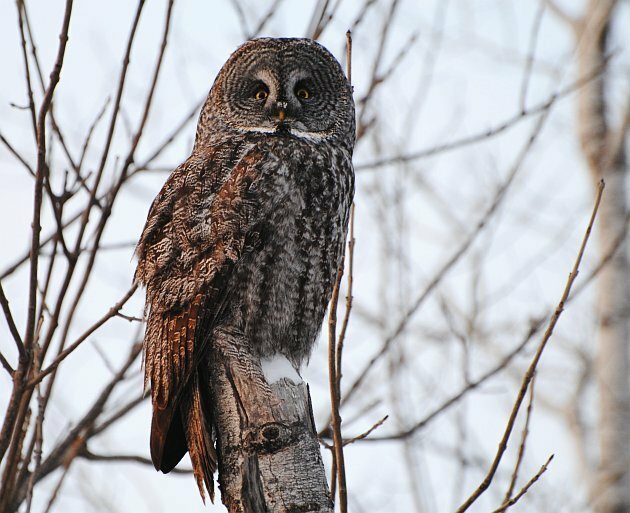 I could hardly contain my excitement as I gazed at a Great Gray Owl and watched it hunt through someone else’s scope. 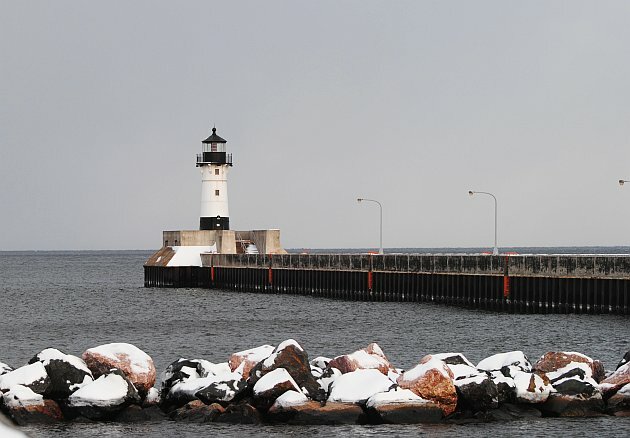 Later in the day, we made the short hop over the border into Superior, Wisconsin to look for the Snowy Owl reported at the airport. Within minutes, I spotted a crisp, cold white bird flying right in front of the car. It was the Snowy Owl, taking no chances while an immature Bald Eagle was passing by. After the larger raptor left, the Snowy Owl quickly returned to a perch on an airport lamp post. The high winds and frigid temperatures made photography difficult, but it felt right to experience my life Snowy Owl in its element among the whipping snow. My last day in the bog had a grand finale in store. My friend spotted a Great Gray Owl right by the road on a snag. I could hardly believe the opportunity to see this species and photograph it at such close quarters. Amazingly, the owl did not pay us any bother as we used the vehicle as a blind. Slowly, this Phantom of the North perched further and further away until it melted back into the forest as the sun finally set. 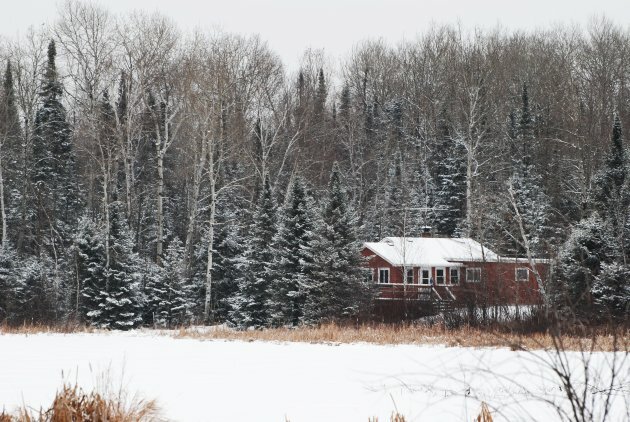 For those who would like to experience seeing boreal specialties such as Evening and Pine Grosbeaks, Hoary and Common Redpolls, Gray Jay, Sharp-tailed Grouse, Boreal Chickadee, Great Gray Owl, Northern Hawk Owl, and Snowy Owl, I highly recommend attending the Sax Zim Bog Birding Festival (http://sax-zimbog.com/birding-festival/) scheduled on February 15, 16, and 17 in Duluth, Minnesota. For those who are not able to schedule those dates and still wish to see and experience this part of the country at any season (after all, Great Gray Owls are resident in the Bog), I highly recommend Erik Bruhnke of Naturally Avian Tours (http://www.naturallyavian.com/) for a great birding experience. Carlos, nice write-up. Glad you had a good trip. Glad I could give you a ride and show you around the area. That Great Gray was pretty sweet. It was a good week. I’m glad we got everything you wanted to see.